I thought for Serve It Sunday I’d share a super easy dessert dish just in case someone doesn’t have the recipe yet. It’s not only easy, but goes over incredibly well for gatherings and buffets. It’s really sweet, yet light and airy, with just a little tang from some pineapple. I’ll write out the regular recipe, then add my notes below it. Stir ingredients together, chill and allow the dessert to set up overnight, and serve cold. My notes: We love this dessert, but we’ve tweaked the recipe a little. First, we prefer to use crushed pineapple. It seems to incorporate a lot more thoroughly, so there aren’t just pockets of tanginess. Second, we prefer to make the chiffon creamier, so I actually use two tubs of cool whip. And last, everyone loves the marshmallows, so I add the whole bag of marshmallows. It makes the dessert a bit sweeter, but gives more umph to the texture, and people can just cut back on the portion size if it’s too sweet to them. In all of the years that I’ve made this I haven’t noticed a difference in brands of the sweetened condensed milk, but I have noticed that some brands of pie filling has a few pits in them, so watch it carefully as you dump it into the bowl. I usually empty the can into the bowl first, just so that I can double check, although Comstock brand has the least problems. The chilling is a huge part of making this dessert impressive. It gives the chiffon time to set up and get super fluffy instead of just creamy, so don’t get impatient and try to serve it quickly. I’m adding a picture of it, although it’s the picture that Eagle Brand posted of it, since they’re experienced with setting up food shots and I’m not. Mine didn’t look nearly as pretty. One thing to note though is that they didn’t let theirs set up, so it looks uber creamy instead of fluffy. Expect yours to look more like the inside of a meringue, all airy, especially if you indulge with my version. 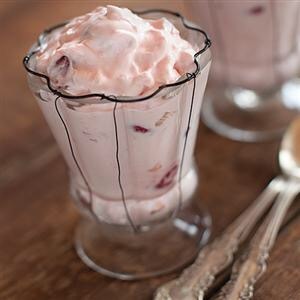 Posted in Recipes and tagged Cherry Chiffon, Dessert, NaBloPoMo, Recipe. Bookmark the permalink.